Spring is finally here, and I have never seen so many flowers before in my life. Last week, we cycled to the famous Keukenhof, which is only open 2 months per year. The slideshow below showcases only a few of the multitude of flowers. This is the 66th year since Keukenhof opened as a permanent exhibition of spring-flowering bulbs, and the garden’s theme this year is Van Gogh. If you click through the slide show, you will see one of Van Gogh’s self portraits recreated in a flowerbed. The name Keukenhof or “kitchen garden” is derived from the land’s original purpose in the early 1400s, when it was part of Countess Jacqueline of Bavaria’s Teylingen Castle (information taken from the Keukenhof website). There are still a few herbs left in the garden, but not many. While the gardens are lovely, this is a hive of tourism, and is so packed during lunch time that you will struggle to take photos without including the arms and legs of random strangers. However, after 4pm, the gardens quieten down considerably, making the period between 4 and 7pm the perfect time to visit since the sun only sets at 8.30pm. Interestingly enough, almost none of my Dutch colleagues have ever visited the gardens themselves because of its perception as being “fake”. I personally think they are missing out on a worthwhile experience. 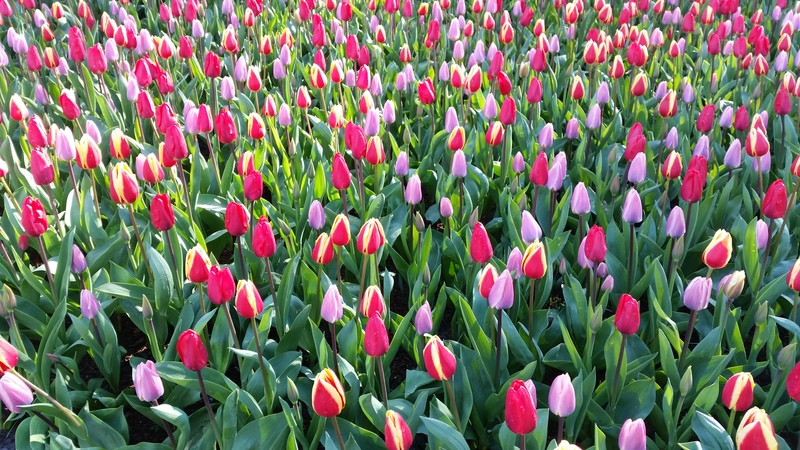 However, if you want to experience the flowers without the tourists, I would suggest biking from Heemstede to Lisse or, if you aren’t feeling athletic, taking the train between Leiden and Heemstede, which passes many kilometers of tulip fields. On my way to work each morning, my train passes tulips in every describable colour. This entry was posted in Uncategorized and tagged Keukenhof, Spring in Holland, tulips, Van Gogh. Bookmark the permalink.